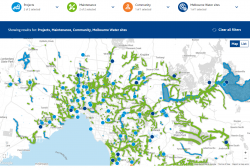 The new Melbourne Water community online map is now up and running on their website! You can access it by clicking on ‘Near me’ on their homepage. This interactive map allows you to do location searches, apply filters, see council and Melbourne Water boundaries, and generate a list of upcoming projects, works and events to find key information about what’s happening in your area. Make sure to save this resource to your favourites to keep up to date.